Three years have passed since the rescue of Thyra and the banishing of Sigefrid and Erik. 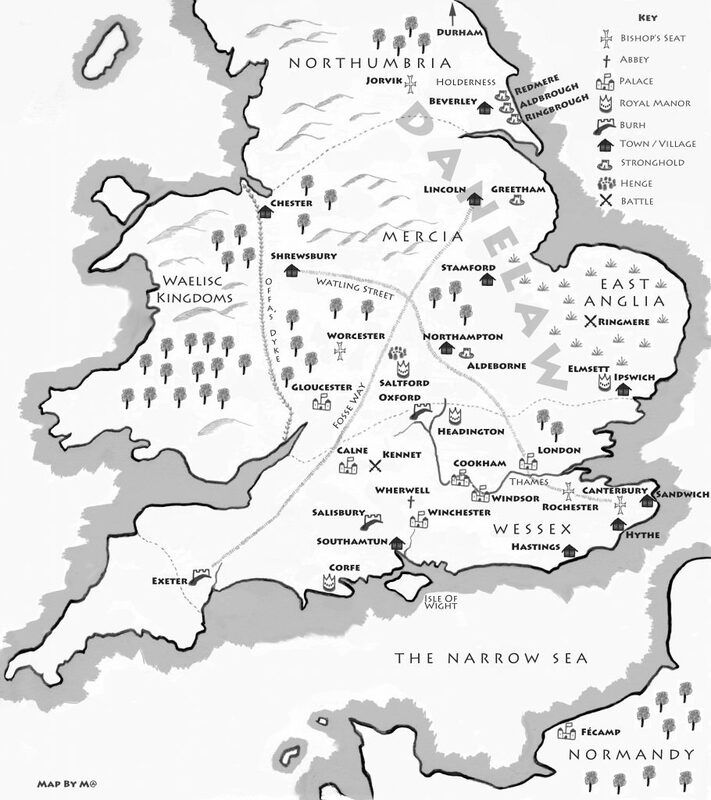 Ragnar and Brida are in Dunholm (Durham), Guthred rules at Eoferwic (Jorvik/York), Guthrum/Athelstan) is sitting like an old hen in East Anglia, Æthelred is Lord of Mercia, and Uhtred is an ealdorman and is living at Coccham (Cookham). The action has moved south now. Want a map? Here. The first scene, of Uhtred’s attack on some ravaging Danes, is wonderfully faithful to the Prologue of SWORD SONG, the book that is the basis for this episode and for those that will follow. Uhtred is protecting his land and the nearby villages from Danish raids. As ealdorman, that is his responsibility – protect the people, maintain bridges and roads, keep the peace, punish offenders. As you can see on the map, Cookham is on the Thames and not far from Watling Street, which is the border between Saxon Mercia and the Danelaw – called the Danelaw because those living there were governed by Danish laws, not Saxon laws. Alfred reprimands Uhtred, at one point in this episode, for following the wrong law. We are west of Watling Street, Alfred snaps. Also, remember that London, at this point, is part of the Danelaw. Alfred’s royal city was Winchester, not London. But I’m getting ahead of myself. Uhtred is now a family man, married to Gisela, with two lovely children – his son Uhtred and his baby daughter Stiorra. Cookham itself is Uhtred’s holding, but it is also a settlement and, somewhere, there’s a burh. A burh is a large, fortified enclosure where the people can go for safety/defense in case of attack. They were a defensive network that Alfred built all across England, and many of them eventually became towns. We don’t see the burh, but at one point we’re told that that’s where Uhtred is. And I’m getting ahead of myself again because… Æthelwold! He’s waiting to see Uhtred to give him a message that is, essentially: I’ve been told by a dead man that I’m to be king. He wants to talk to you because you’re going to be a king, too. Now, just when we thought that maybe Æthelwold was showing some promise, he slips back into stupidity. I don’t mean the talking dead. The Anglo-Saxons believed in ghosts, as did the Danes, the Celts – heck, everybody in the 9th century, pagans and Christians, believed in supernatural beings, both benevolent and evil. No, I mean, Æthelwold has been colluding with Danes. He’s gone into the Danelaw – forbidden territory – and we know that Alfred is keeping him on a short leash and he’s been very naughty. Uhtred knows it too, so he’s in no hurry to go talk to the Danish dead. Alfred would not be happy about it, and Gisela warns him probably 3 times in this episode not to get on Alfred’s bad side. Next thing you know, Alfred arrives at Cookham, and we have a couple of scenes in which the discussions range from Æthelflæd’s upcoming marriage (Odda: The purpose of marriage is not to be happy); to Æthelwold’s naughty excursion into the Danelaw (Uhtred: Put him on trial, lord, and then kill him. Just saying. ); to the Viking threat at the mouth of the Thames that should be Guthrum/Athelstan’s problem but about which he is doing nothing (Uhtred: Guthrum won’t stop them, lord. Send ships and men to Benfleet before they find a leader and become an army). Alfred doesn’t like Uhtred’s suggestion about Benfleet because he doesn’t want to break the peace that he has worked so hard to build. He is not a preemptive strike kind of guy. But before the episode’s end, Æthelwold will observe that Alfred’s peace is already over, and early on we are given the reason why. Erik, brother of Sigefrid, arrives at Cookham while the king is there (I don’t know why Uhtred isn’t more nervous about this) and makes nice with Uhtred for a few minutes, letting him know that the power structure in southern England is about to change. Erik is the friendly brother; nicer than the surly, now one-handed Sigefrid. Remember that. Sigefrid, Erik says, is bringing 19 ships (that’s 500 men) from Frankia to the fort that the Danes have built at Benfleet. They are not going to stay at Benfleet but will make bold inroads on Wessex. It’s clear that Erik wants Uhtred to join them. Well, we’ll see. In Winchester preparations for Æthelflaed’s marriage to Æthelred are under way, and Alfred tears himself away from his work for a moment to look fondly upon his daughter in her wedding finery before going back to his parchments. Alfred is definitely a Type A personality. Æthelflæd, who already looked 22 three years ago when she was 11, hasn’t aged a bit. She still looks 22, but now she’s 15. Nobody else has aged either, certainly not Uhtred. Apparently, I’m the only one who has aged since the last episode. Look at the map on the wall! There are maps all over Alfred’s chamber, but we haven’t found any maps from the 9th c. Sad. Regarding the upcoming nuptials, Gisela observes that a peace cow is just a whore in a wedding gown. Peaceweaver is the Anglo-Saxon term, but Cornwell uses peace cow and I’m glad that writer Stephen Butchard managed to work that in. Father Beocca, though, has found love with Thyra. In the book this happened much sooner, and they already had children by this time. I was afraid that Stephen Butchard was going to cut this relationship, but I need not have worried. Priests, by the way, could marry in 9th century England, but the stunned reaction of the royal family to Beocca’s announcement is hilarious. And we need some hilarity because things are about to get dark. Uhtred finally decides to go visit the ghost. He heads into the Danelaw with Æthelwold, and when Alfred learns of it he puts a guard on Gisela. I feel the need to defend Alfred here. He’s a worried man. Danes are traveling through Mercia to hit Saxon villages; Lord Æthelred, in Mercia, is ambitious and has his eye on Alfred’s throne (his reason for marrying the king’s daughter, duh); there are Danes gathering at Benfleet but Guthrum/Athelstan is doing nothing to stop them; Æthelwold thinks he is the rightful king and is apparently plotting with powerful Danish warlords; Uhtred is married to a Dane, has a powerful Danish brother in the north, and now is hanging with Æthelwold and his Danish buddies. Alfred is, like the king on that Tæfl board last episode, surrounded by enemies and does not know who he can really trust. And then there’s Dead Bjorn. Uhtred and company arrive at Eilaf’s hall, and the dead guy couldn’t possibly be any scarier than these thugs hanging out with Eilaf. Haesten is there – Uhtred saved his life at Eoferwic – and the lead-up to the meeting with the undead is appropriately creepy. Now, Uhtred himself has played an undead horseman, so he’s appropriately skeptical. He orders Sihtric to hide and keep an eye on what happens after the meeting with the dead guy is over. Sihtric, the ninny, will get scared and run away. But they are all scared, Finan probably most of all because, hey, he’s Irish and probably more superstitious than anyone. Things get under way when a man is killed to beckon the Dead Bjorn, and, yes, that was gross, but he was a thief and by Danish law he was doomed, so no one bats an eye except Æthelwold who is a dweeb. Dead Bjorn is remarkably eloquent in his prophecy: Tonight, London’s streets are red with Saxon blood. And Uhtred, he says, will one day be the Mercian king of both Saxons and Danes. And so we anticipate that London – beautiful London – had better look out. I love this model of London. Cornwell describes the wall surrounding the city as studded with circular bastions, built by the Romans, so you can see two of them here. There is a model of Roman London in the crypt of All Hallows that shows a similar gateway into the city. Nice bridge! And the Thames is appropriately WIDE. This entry was posted in The Last Kingdom and tagged Aethelred, Anglo-Saxons, Gisela, historical, King Alfred, London, TV Series, Uhtred. Bookmark the permalink.